Arguably the most adorable bath product around, Lush's Christmas offering of the Melting Snowman bath melt is definitely one to try. I mean, who could resist a bath product that is shaped like a snowman, nose and all? At £1.95 it is definitely one of Lush's cheapest bath products, so it wont break the bank and would make a perfect stocking filler. Prior to a little shopping trip a couple of weeks ago, I'd never tried any of the Christmas products from Lush, and I'm feeling slightly disappointed that these aren't available all year round! This particular bath melt contains bicarbonate of soda, which will leave your bath water cloudy and soft. It doesn't do any specific tricks, as opposed to say The Enchanter, but your skin will love you for it. It is fragranced with the scent of Hot Toddy, a previous Christmas favourite containing cinnamon, clove, patchouli, benzoin, lime and wild orange oils. The spicy scent may not be approved of by all, but it's definitely a winner in my books. Did I mention it contains dairy free chocolate for the eyes and a stem of ginger for the nose, making it suitable for vegans? I'll be stocking up on this over the Christmas season as it makes for a nice warm, comforting bath. 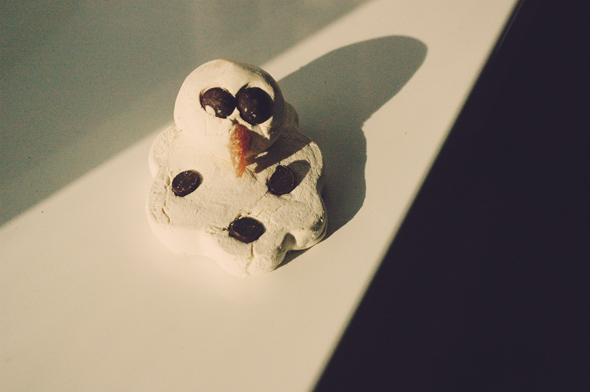 Have you tried the Melting Snowman bath melt? *It has been mentioned online by some that the previous Melting Snowman contained the scent of the Snowcake soap. Please be aware of this before buying to avoid disappointment! I really really really want this, it's such a nice product! Aww, The snowman looks so cute! It's a bit sad thinking about eating off its chocolate eyes and ginger nose.. Poor man! Me too, felt as if I was killing him haha!